The August program page has info on events this weekend and next week (highlights below). The September page is available if you want to plan ahead (there's also a list of sites scheduled to open on Labor Day). 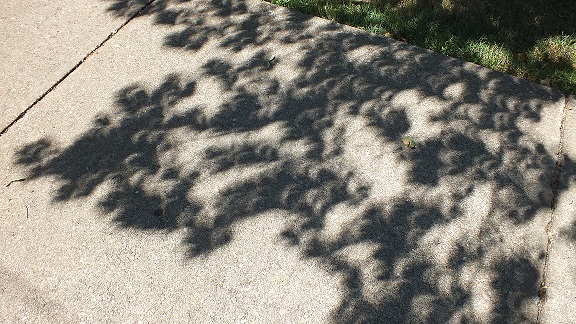 So, eclipse fever is fading, but I think most of us will agree that it lived up to the hype. That's saying something in our full-of-hype lives. 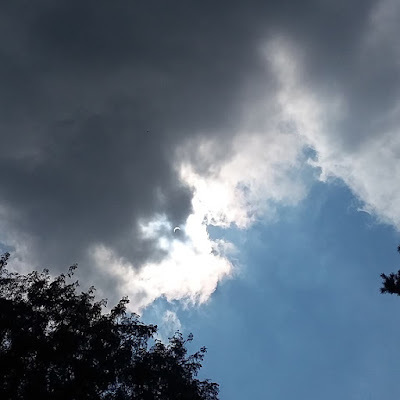 I was intrigued by the posts I saw on Facebook and Twitter with historical accounts of eclipses past and fascinated by the photos from friends and strangers along the path of totality or the path of partiality. It was fun to build my own pinhole projector out of a cereal box (thanks NASA and State Museum Planetarium for the instructions). It worked fairly well, too, with a little trial and error. It was even more fun to look through the eclipse glasses that the boss bought to share with staff. We passed them around among our office staff and then other agency staff and even just other folks out on the Keystone Building and Museum plaza. A shared experience and then back to work. If you still have eclipse glasses and won't be using them again in the near future, Gizmodo reports that you can donate them to Astronomers Without Borders for reuse by kids in developing countries to view eclipses in 2019. Or you can donate money for them to buy new glasses, but they're using this opportunity to create a stockpile (read more about it). Here are a couple more eclipse-related photos you may not have seen (or scroll down to see Trails of History events coming up this weekend). Fun fact: Erie will be in the path of totality for the next solar eclipse visible in the US, in April 2024! Aug. 26: Spotlight Saturday—glimpse life and work in the 19th century through demonstrations and tours - this week is woodworking and children's games. Included in regular admission, so please start at the Visitor Center. 11 am-4 pm (site open 10 am-5 pm). Aug. 27: Meet Our Lambs—Pennsbury adopted two lambs earlier this month and they are now ready for their debut. You can admire their adorableness and vote on names for them (more info on Facebook). Plus lots of other stuff to see and do, as always. Included in regular admission. 12:30-5 pm. Aug. 27: Bitters, Blubs & Brewing—visit with the gardeners and stop by the brew house to see what's up. Visitors age 21 and older who pre-register and pay the $20 fee can learn to make their own bitters Call 215/946-0400 to register. 2-4 pm. Aug. 25: Free Summer Friday and Learn at Lunchtime—general admission is free, 9 am to 5 pm (regular fees apply for the Planetarium). Curiosity Connection will have free timed tickets available. Today's Learn at Lunchtime is a special tour of the "Pennsylvania at War" exhibit, 12:15-12:45 pm. 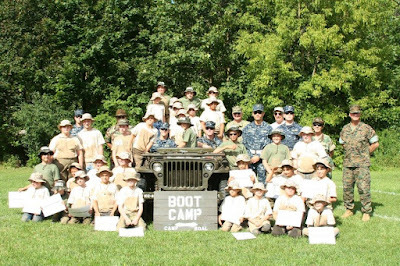 The August program page has info on events coming up this weekend and the rest of the month. There's always history to learn and learn from on the Trails of History. In my opinion. So, okay, we in Pennsylvania will see only a partial solar eclipse. Safe travels and good times to those of you venturing into the path of totality. I'm sure it's going to be a zoo, but a rare opportunity in the U.S. Be nice to the people whose states and towns you're visiting and clean up after yourselves. No one wants to see news photos of Woodstock-esque trash piles. Not sure why I'm lecturing on this - trying to do my part for peace, love, and understanding, I guess. The State Museum Planetarium has been sharing lots of info about the upcoming eclipse. There's still time to catch "2017 Eclipse Across America" today and this weekend for a great explanation of eclipses. 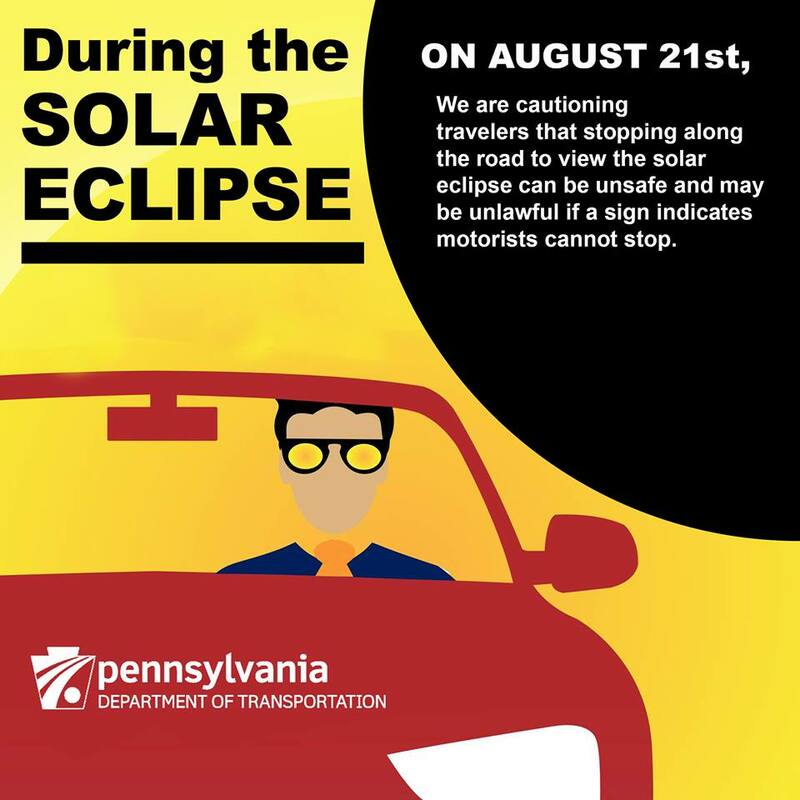 Because PA will see a partial eclipse (75-80%) we won't be able to look directly at the sun at any time without protection. 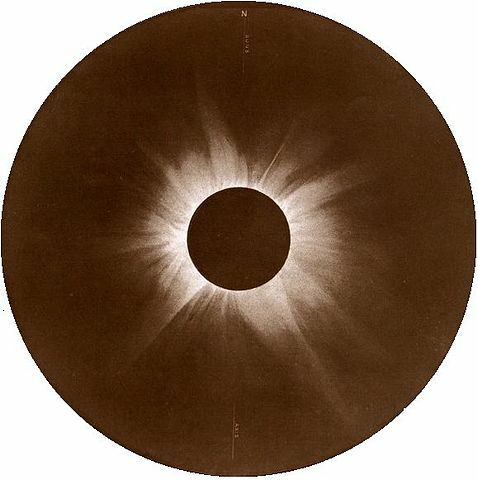 If you don't have a pair of eclipse glasses or a specially equipped viewer of some sort, the museum shared NASA's instructions for making a pinhole projector using a cereal box. I may have to try that this weekend if my husband finishes off the Froot Loops (UPDATE: he already has). UPDATE: Planetarium director Linda Powell was on abc27 Friday morning to talk about the eclipse (watch it here). 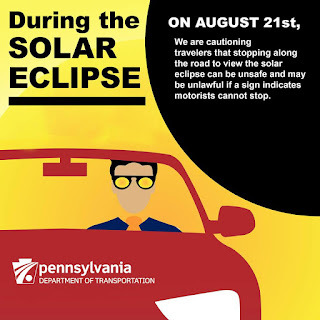 On a related safety note, PennDOT reminds us that it can be unsafe and may be unlawful to just stop alongside a roadway to watch the eclipse. Washington Crossing Historic Park has posted info for those who might want to view the eclipse from Bowman's Hill Tower. Let us know in the comments if you have other eclipse-related posts to share! And for those of you who remember the 1980s, I leave you with this. Bonnie Tyler will, if all goes according to plan, perform "Total Eclipse of the Heart" during the eclipse on board a cruise ship in the Caribbean. Enjoy the earworm. Please visit the August programs page to find info about events on the Trails of History. There is no discernible theme to this week's post (shocking), so don't try to find one. On the other hand - if you do try, and you do find one, feel free to let me know in the comments! Otherwise, enjoy the stroll and enjoy the weekend. 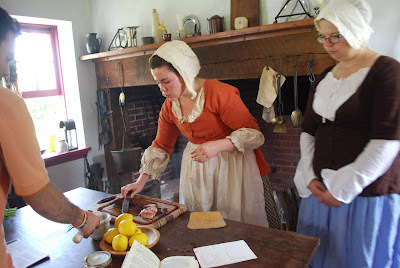 The first of four hearth cooking classes, "Let Food Be Thy Medicine," was offered at Graeme Park this past Sunday (to see other photos visit Graeme Park's Facebook page). It's not too late to sign up for the remaining three (discounts offered for members and for multiple classes). Online registration is available. Bushy Run Battlefield commemorated the Battle of Bushy Run (Aug. 5-6, 1763) last weekend with their annual two-day reenactment. So that visitors can get the full scope of the history in one day, they always reenact the action of August 5 on Saturday morning and August 6 in the afternoon (then repeat on Sunday). An epic effort by Bushy Run board, staff, and volunteers along with all the reenactors who take part presenting British, colonial, and Native American forces. Museum facilitator Colleen Madore shared some photos with me (one of them is above) and there are more photos and video on Bushy Run's Facebook page. 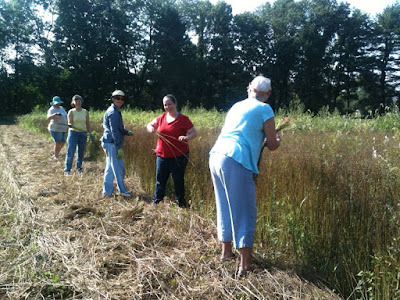 Landis Valley Village and Farm Museum shared some photos of Heirloom Seed Project staff and volunteers pulling and bundling flax plants that are now ready to be turned into linen at Colonial Williamsburg (close ups of the bundles on FB). If you get a chance, catch "2017 Eclipse Across America" at the State Museum Planetarium between now and August 20 for a good overview of how eclipses work and what to expect from the one coming up on Aug. 21. If you haven't already gotten eclipse viewing glasses from a reputable dealer, you may have to improvise (here in PA, we'll get a 75-80% partial eclipse, which requires eye protection the entire duration). National Archives has a new digital catalog of "famous faces in the military" featuring military records and photos of "people of exceptional prominence"
The full August program page is available for those of you who like to plan ahead. I've highlighted events coming up this weekend and next week in the space below. Aug. 5: Labor Heritage Day—commemorating the coal miners' and laborers' strike of Aug. 1, 1877. At 2pm, an original play, After the Shots were Fired, by Margo L. Azzarelli, Marnie Azzarelli and Alex Lotorto, will be presented in the auditorium. The one-act play commemorates the 140th anniversary of the 1877 riot on Lackawanna Avenue where four men lost their lives during a time of labor unrest in the country. (After the Shots were Fired is funded by a Lackawanna County Arts & Culture Community Project Grant.) The day will conclude with various labor related literary submissions being read from members of our local community. Light refreshments will be served. The heritage day events are free; museum admission is charged to view the core exhibits. Noon-4 pm. Aug. 5-6: 254th Anniversary of the Battle of Bushy Run—there are two battle reenactments (morning and afternoon), so you can learn about the events of August 5 and 6, 1763, all in one day. You'll also find military camps, period craftspeople, and food vendors at this annual event. Admission is $8 for ages 13+, $5 for ages 4-12. 10 am-4 pm both days. Aug. 6: Living History Sunday—learn about life in Berks County in the mid-18th century. Guided tours offered. Noon-4 pm. Aug. 8: Lecture—Jim Polcynski will present "Transition from Grubbs to Colemans." Learn about the transition of ownership of the Cornwall Furnace, Ore Banks, and related properties from the Grubb family to Robert Coleman in the late 18th century. Part of the Friends of Cornwall Iron Furnace lecture series, the program takes place in the auditorium of Freeman Community Center at Cornwall Manor. 7 pm. Aug. 5: Colonial Games and Gambling—learn about and try your hand at a variety of early American games, such as cards, hazard, draughts, dice, and backgammon. Peanuts will be used for wagering. 2 pm. Aug. 5-6: Historic Pithole Open—the visitor center will be open, so enjoy the orientation film and the excellent diorama that shows the town in its heyday. Admission charged. 10 am-4 pm. Aug. 6: Drake Well Marathon and 1/2—this is a qualifying event for the Boston Marathon. Both races (full marathon and half marathon) begin and end at the Museum and make use of Titusville streets and the bike path in Oil Creek State Park. Proceeds benefit Drake Well Museum and Park. You must register to participate. Aug. 5-6: 1940s Weekend—learn about life during World War II through home front and military displays, music, food, and more throughout the site. Off-site at 6 pm on the 5th, there will be a Swing Dance at Freeland Public Park Pavilion. Admission charged (separate fee for dance). 10 am-5 pm. Aug. 6: Ice Cream Social—ice cream (courtesy of Turkey Hill and dipped by PA State Representatives Mindy Fee and David Zimmerman) and an old-fashioned sing-along in a beautiful setting. K-Pets therapy dogs will be visiting, and the winning ticket for quilt raffle will be drawn. Admission is $5 per person for ages 6 and up (younger than 6 get in free). 1-4 pm. Aug. 8: Erie Gives—you can support the museum and ship and stretch your donation by participating in Erie Gives Day. Online giving only, 8 am-8 pm, on the Flagship Niagara League's Erie Gives page. Aug. 5-6: Guided Tours—docents will lead one-hour tours of the museum exhibits twice daily on weekends this summer. Visit Fort Pitt's Facebook page for this weekend's tour times. Aug. 5 and 6: Living History Programs—this "Artillery and Artificers" explores the fort's artillery, the people who fired it (with demos during the day, weather permitting), and the people who made it; 11 am-4 pm both days. The Fort Pitt Fife and Drum Corps will be on hand Sat., Aug. 5, from noon to 4 pm. Aug. 6: Hearth Cooking Class—today's class, "Let Food Be Thy Medicine," is the first in a series of four offered this month. Each class is $45 per person ($35 for members), but there are discounts for taking multiple classes. Check out Graeme Park's e-newsletter for details on the other classes and for a link to register for one or more. Aug. 6: Oxygen Day—in honor of Dr. Priestley’s best known scientific contribution, this program features costumed docents throughout the house and chemistry demonstrations (more info on the website). Admission is free. 1-4 pm; chemistry demos at 1:30 and 2:30 pm. Aug. 8: Hands-On History Day—experience chores, games, and crafts from the past, take a wagon ride, and learn your lessons in the one-room schoolhouse (more info and online ticketing on website). Cost is $11 per person (FREE for Landis Valley Associate members and kids age 5 and under). 10 am-3 pm. Aug. 5: Spotlight Saturday—glimpse life and work in the 19th century through demonstrations and tours. This week's focus is blacksmithing. Included in regular admission, so please start at the Visitor Center. 11 am-4 pm (site open 10 am-5 pm). Aug 5-6: Guided Tours—the 1 pm guided tour each day is included in museum admission. Aug. 4: Free Summer Friday, StoryTime, and Learn at Lunchtime—admission is free all day on Fridays in the summer; timed tickets will be available for 45 minutes of play in Curiosity Connection; regular fees apply for the Planetarium. Today's StoryTime program (10-11 am) will include a tour of selected works in the "Art of the State" exhibit and a reading of Perfect Square by Michael Hall. Today's Learn at Lunchtime program (12:15 pm in Nature Lab) is "Pennsylvania Birds." Aug. 6: Artist's Conversations—take an informal tour of this year's "Art of the State" exhibit with artist Michael Brolly, first prize winner in the Craft category, and Collections Advancement Project curator Carol Buck. Included in general admission. 2-3 pm. Aug. 7-10: Nature Lab and Planetarium—visit the Museum's events page for details. Aug. 6: Kayak the Canal—all equipment will be provided and no kayaking experience is required for this leisurely paddle along the Delaware Canal. Cost is $5 per person and you must pre-register. Register online for either the 10 am-noon paddle or the 1-3 pm paddle.